Nautica excels in aquatic themed scents. Nautica’s fragrances are especially great for the warmer months of the year. However, Nautica has released several different models to the market. Hence, people often wonder what the differences are actually between the different aquatic scents. In the following article, we put two Nautica fragrances against each other to help you choose. Nautica Voyage was launched in 2006, whereas Nautica Voyage N83 was released in 2013. So, which is the best Nautica fragrance for you? See the comparisons between Nautica Voyage vs Voyage N83 below. Previously, we discussed about Nautica Voyage vs Nautica Blue. Quite similarly, the first significant difference between Nautica Voyage vs Nautica Voyage N83 is the scent notes. Although both are aquatic scents suitable for day wear in summer and spring, they have very different characteristics. Interestingly, the opinions are quite evenly split on this matter. Nautica Voyage has an opening that features fruity, somewhat citrusy notes coming from the combination of apples and green leaves. The opening is very fresh and energetic. Meanwhile, the heart notes are mimosa and lotus, whereas the base notes are amber, musk, oakmoss, and cedar. 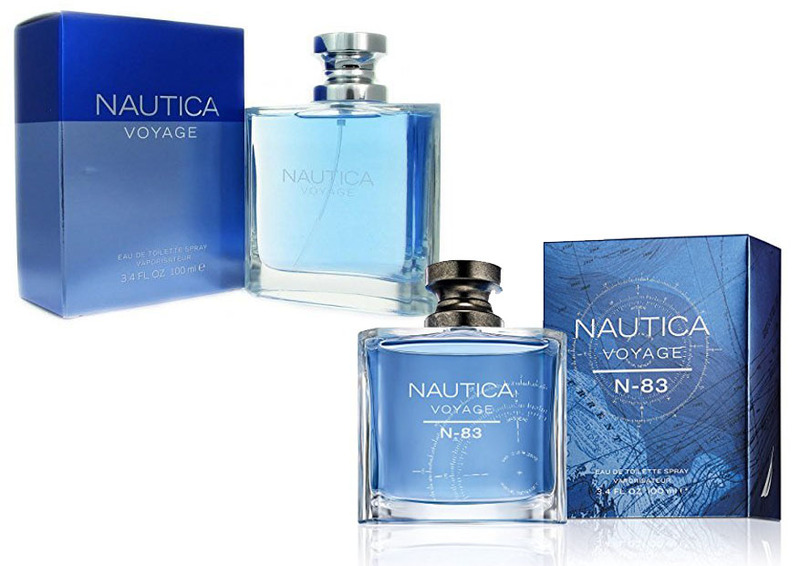 On the other hand, Nautica Voyage N83 comes with a fully aquatic opening that is enhanced by spicy mint and petitgrain. Hence, the opening becomes very cool and minty and somewhat salty. The heart notes consist of cardamom, nutmeg, and lavender. The base notes are musk, sandalwood, and cedar. The people who like Nautica Voyage better think that the fragrance smells more refreshing, pleasant, and interesting. This is a fragrance for a man who is ready for some adventure. On the other hand, the people who like the Nautica Voyage N83 better think that it appears cooler and more professional. However, the scent is rather simple and linear, without any dramatic transformation. Honestly, both Nautica Voyage and Nautica Voyage N83 are quite versatile. Both are great casual fragrances that you can use for school, work, going out, etc. However, Nautica Voyage has the better edge for casual occasions because the scent is more “easy going”, whereas Nautica Voyage N83 would fit better as office cologne that is not very intrusive. Between the two, Nautica Voyage once again has the better edge. Nautica Voyage N83 is more on the weak side. Nautica Voyage has a moderate sillage; it is not super powerful but it is quite noticeable. It projects well. On the other hand, Nautica Voyage N83 can easily fade away and turn into a skin scent within five minutes. Nautica Voyage is quite long lasting. It can last for several hours, even in a bright summer day. Nautica Voyage N83, on the other hand, has a rather weak longevity. The scent can last for just one or two hours. It all comes down to your personal preference. Some people like the fresh, fruity aquatic scent of Nautica Voyage better, whereas some others prefer a minty professional scent of Nautica Voyage N83. However, we recommend you to choose Nautica Voyage because it has better projection and longevity. It is also somewhat more versatile, usable for work as well as going out.